Sri Lankans have to passionately believe, invest and practice integrity as a nation to even stand a chance of fighting corruption, concurred an eminent panel of experts recently, calling on Sri Lankans to consolidate the change made last year and expand it to all segments of their lives. The public needs to put aside bribing for convenience and step forward to eradicate the menace of corruption, believes Sri Lanka’s straight-talking champion of good governance, Bribery and Corruption Director Generation Dilrukshi Wickremasinghe, who also gave rare praise to Parliamentarians, saying only 90 have complaints against them. 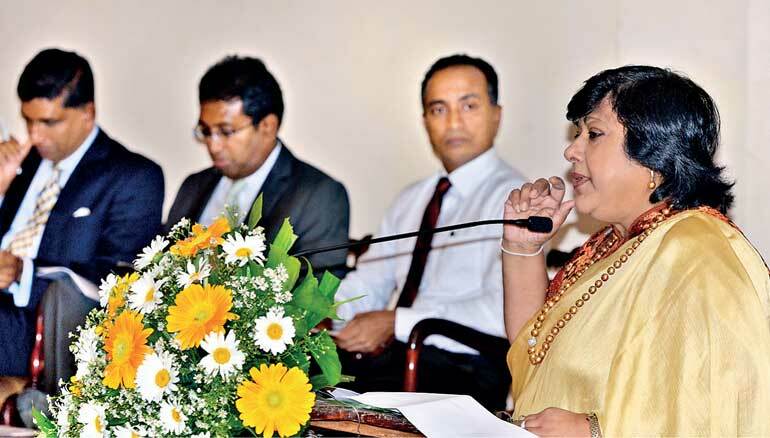 With customary gusto, she delivered the keynote address ahead of a panel of experts deliberating on where Sri Lanka is on the path to good governance. 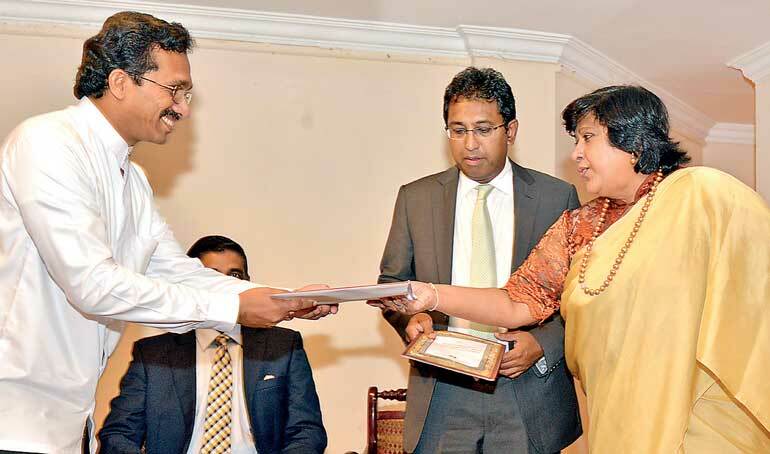 The seminar was jointly organised by the Colombo MBA Alumni Association and the Daily FT last week. Wickremasinghe went onto give a rare commendation to the Members of Parliament, pointing out that in numbers at least, less than 50% of them had corruption complaints against them. Nonetheless it is essential for the public to remain vigilant to ensure that politicians stay away from conflicts of interest and behave honestly. “Out of 225 members, we only have complaints against 90 of them so less than 50%. So let us add another 10% in case someone forgot to complain but we still have 112 members who are good politicians. There are good politicians so don’t put everyone in that basket and count every politician as corrupt. If you take the local governments and add another 10,000 into that list, then we are left with the public servants. I can assure you there are many, many honest public servants. She questioned as to why Sri Lanka is unable to put such a small quota of people behind bars. The Director General insisted that she was a firm believer in her crusade but without the rest of the public behind her, it would be an impossible task. “If you think the few Parliamentarians and the several dozen people in the Bribery Commission can do this, then you are dreaming.” Putting responsibility back to the people, the Director General stressed that people have to identify that there is a problem in the country and work together to wipe it out. Prominent lawyer J.C. Weliamuna was insistent that the legal and accounting manipulation of the system made corruption worse in Sri Lanka and sought to direct the debate towards legal chances that can be implemented to empower public officials who could fearlessly come forward to identify wrongdoers and be State witnesses. “I hope the Government responds positively to reforms that we have suggested that would depoliticise the public system and allow civil servants the independence to move forward and join us in the fight against corruption,” he said. Weliamuna, who has been appointed to several commissions under the new Government to probe corruption and has investigated a slew of allegations against large-scale white collar crimes, was unshakable in his stance that “legal and accounting manipulation is key to corruption”. Weliamuna called for a set of laws to push such public servants to become State witnesses and took an uncompromising stand in advocating the creation of a fear psychosis so people would return to fearing the law rather than the current practice of finding loopholes or circumventing verdicts. Sri Lanka needs to become part of the international movement to fight large-scale corruption and lead the way by putting major criminals behind bars. Strengthening institutions was focused on by Attorney-at-Law Harsha Fernando, who recalled that Sri Lanka had survived nearly three decades of war because of five core institutions – the Central Bank, Finance Ministry, Judiciary, key public servants and the media. Drawing a link between cultural practices and corruption, Fernando pointed out the Sri Lankan trait of giving gifts made the acceptance of bribery much easier. This idea of appreciation has filtered across society to the point that it is not just accepted but expected that valuable gifts must accompany tasks, even if they are simply the duty of individuals. This nexus between gift giving and bribery allows Sri Lankans to blur the lines to the extent that inappropriate gifts are overlooked, he said. 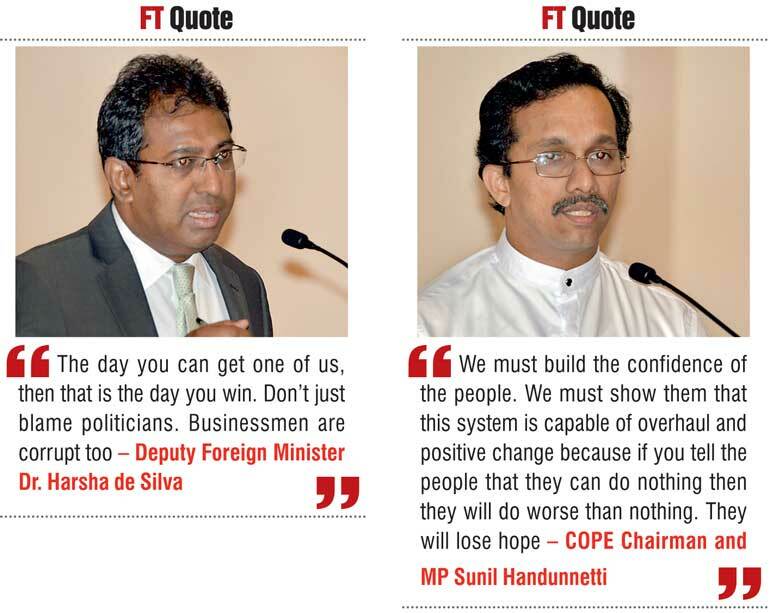 Aside from this sense of entitlement, Sri Lankans also have a poor understanding of conflicts of interest. Most of them accept bribery as wealth redistribution, especially when salaries of public servants remain at low levels, resulting in the governance system essentially promoting corruption. It also has weak systems of accountability, Fernando noted, highlighting that only the Colombo High Court is empowered to hear cases of corruption and money laundering, creating a massive bottleneck for accountability. Lack of confidence in institutions leads to apathy, opined Fernando, who said court cases frequently dealt with small amounts of money, usually less than Rs. 180 million, even though there are plenty of allegations dealing with far larger amounts. “Lawyers and accountants are probably two of the worst in money laundering because if you look at the two professions including auditors, they are ones that have manipulated the accounting and legal systems and so on, which is the core of the huge international problem of money laundering. This costs at least $ 500 billion a year. The recent revelations of the Panama Papers are nothing new, we have seen similar issues in Sri Lanka and many other countries. The bigger the amount involved in the crime the easier it is to hide it, launder it, and ensure it is never caught. At a practical level it gives incentives to people to assist the smooth flow of fraudulent transactions rather than upset the system and report it. Fernando noted that the Government has to make Administrative Regulations and Financial Regulations, particularly governing public servants in ministries, more adaptable to the challenges facing governance today. Existing regulations do not take into account the situation of public servants who are usually dependent on ministers for their jobs and are moved around on political whims. This vulnerability is extended to the Attorney General’s Department that has little space to contravene the Government system. Fernando also supported a productivity-based appointment system for judges, particularly those well-trained in criminal law to be appointed to courts in Colombo so that key corruption cases can be fast-tracked through a handful of courts rather than the present system of only senior judges hearing cases, which drag on endlessly and make the public lose faith in the judicial system. 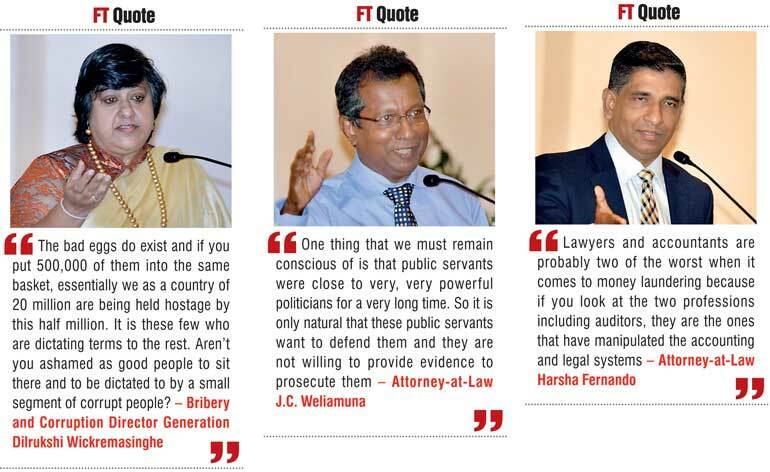 Deputy Foreign Minister Dr. Harsha de Silva, who has long been a anti-corruption activist, put the bar very high saying that Sri Lankans could only feel they have achieved good governance when they are empowered enough to put a sitting Parliamentarian or minister behind bars for wrongdoing. Dr. Harsha also shared a personal experience detailing how a Rs. 1 million road in his electorate had been repaired without the correct tar density and how contractors send false samples to laboratories so payments are made fraudulently. Dr. Harsha pledged to continue fighting corruption and expressed hope that the public would continue doing their share of the work and supporting him to promote good governance. Committee on Public Enterprises Chairman and MP Sunil Handunnetti gave a hard-headed analysis of the challenges to stamp out corruption, terming the current time a “transitional phase” which would decide whether Sri Lanka would move forward towards prosperity or disintegrate into corruption compounded by minority issues. Displaying the volumes of Sri Lanka’s Constitution and Standing Orders of Parliament, Handunnetti posed a philosophically-tinged question to the audience. “Do we lack the law or do we lack the system?” he questioned, expressing that gaps in the law are compounded by complicated systems. For example, the Constitution gives oversight of public finance to Parliament but stops short of specifying the contours of those powers so lawmakers are often confused and uncertain of how to proceed. “Whatever the ministers of this Government like to believe, among the public there is a deep-seated belief that rich politicians go to the Prison Hospital and only poor people go to prison. The issue of raising corruption has to be depoliticised; a person be it a minister or anyone else, should have the capacity to stand up and be a whistleblower without it being a measurement of his loyalty to a political party for Government,” he said. Handunnetti also touched upon the many constraints of engaging the public, emphasising that the media, because it is controlled by politicians and business interests, does not have the capacity to monitor effectively. Low competency of journalists also limits the amount of information that can be shared with them. The COPE Chairman also criticised the deep apathy of heads of Government and public institutions who did not consider it their responsibility to probe corruption within their own organisations. “Top public servants now have a readymade answer to our questions during COPE sessions. They say ‘Sir, all the files have been sent to the FCID’. This glib answer covers everything for them. It is appalling that these officials do not consider it their primary responsibility to investigate corruption charges from within their own organisations. Instead they now pass the buck to other bodies and try to wash their hands,” he complained. The lack of an audit law is also a glaring impediment to fighting corruption, he said. Cabinet committees are in charge of procurement but there is no overarching procurement law that could be used to flag corrupt or inconsistent decisions or provide accountability to very powerful committees, he added. Good governance activist Chandra Jayaratne made the most serious condemnation of professionals, rolling out multiple examples and arguments as to how lawyers, bankers and accountants have let standards fall to allow corruption to flourish. Jayaratne pointed out that the era where audit reports were rejected multiple times before they were signed off on is over and therefore new procedures and regulations have to be established for higher standards to be upheld in the accounting profession. “If there have been any compliance, legal or statutory failures, especially in taxes, they must be included in the reports. There is a society that is outside shareholders and directors, there are companies with letters, creditors and people who have given loans and the State is also there and they have a right to know what is happening within these companies. Calling on professionals to “wake up,” the good governance activist went on to emphasise the need to train younger professionals entering into the profession even if it means operating costs increasing. Jayaratne detailed how average people have to jump through multiple hoops and fill in endless documentation to open an account but how black money is collected and filed into accounts by bank managers. He alleged that drug money is often collected and filtered into the legitimate financial system in this manner and often banks deliberately target such clients to improve their revenue on paper. “Seventy-five of the cases we have investigated have no ‘know your customer’ documents in the bank. There is a well-known money launderer and drug peddler. His money is collected by a bank sending a vehicle every morning. They bring the money in a gunny bag, the bank manager counts the money, writes the paying in slip and puts it in. It is banked. Wherever there have been investigations, we have found about 50% of the pay in slips have been filled in by the bank managers. When account holders are asked how they came by the money, they profess not to know. Lack of oversight by such auditors could be presented as evidence in court, warned Jayaratne, who also repeated that this would be incentive for the public to demand answers from professionals. Lawyers have also assisted people to hide their assets and pay fewer taxes to the Government, noted Jayaratne, trotting out example after example from his experience as an activist on unethical real estate transactions. The change demanded by voters in 2015 remains strong, opined Jayaratne, warning that the message is yet to reach Sri Lanka’s professionals. “What all this means is that professionals have failed,” he noted, recalling a similar address at the Inland Revenue Department where even senior commissioners were unaware of the latest Financial Intelligence Unit Gazette that binds key financial institutions including charity organisations but few people are aware of it. “We are talking about Mossack Fonseca as a big issue. In this country today you can buy what is known as ‘investments in orbit,’ which means it is in a cloud somewhere and registered in a tax heaven. One can sign a document saying it is not owned by you. The amount you have to pay is $150 for that trust document. Do you know that to the best of my knowledge there are four international fund managers who have representatives in this country with offices and each of them costs well over Rs. 10 million every month to maintain? Surely if you are spending that kind of money you are making several times that by doing business in Sri Lanka. Even professionals who are aware of the illegal plots they are part of are unwilling to come clean either because of loyalty to their company or other vested interests, insisted Jayaratne. Even large-scale projects are evaluated based on high-level political connections rather than independent analyses and Gazettes are issued on the discretion of ministers, he charged. Despite professionals having codes of conduct, many are largely ignored and knowledge remains poor, Jayaratne said, calling for this situation to change. Even Sri Lanka’s Institute of Directors needs to make more substantive efforts to improve integrity within professional spheres, he added.